Open plan living, one bedroom suite and showerroom with private garden. 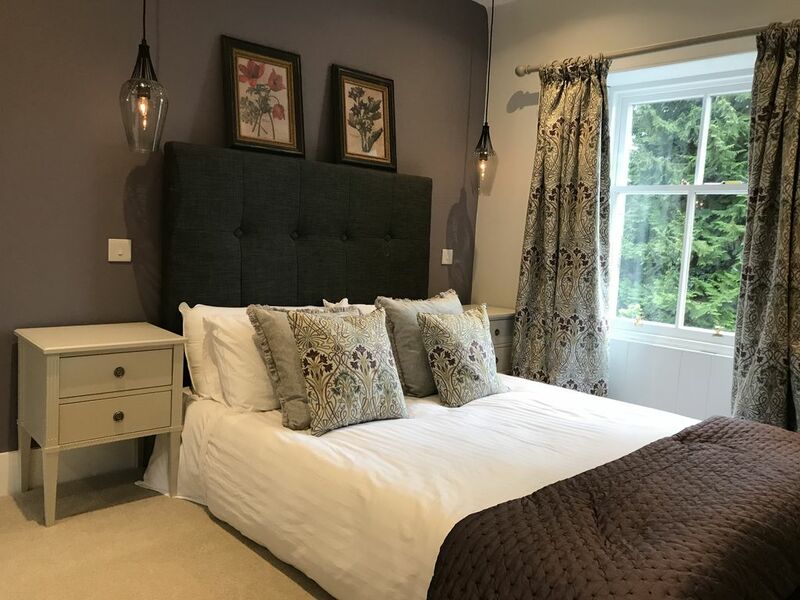 The Cottage has been newly renovated for 2018 to offer luxurious boutique style accommodation for couples looking for a romantic break. This 200 year old C-listed cottage is situated in the heart of Dunblane, minutes away from the Cathedral, museums, restaurants & shops. We have upgraded the entire property to a very high standard with stylish decoration and beautiful furniture. Downstairs is an open plan living space, with a large fully equipped kitchen which includes a dishwasher, induction hob, oven and fridge with a small freezer. In the back utility there is a washer/dryer. The dining area is all set for you to enjoy relaxing meals. A lovely wood burning stove makes the living area cosy and very inviting after a long day enjoying all Dunblane has to offer. With a smart television and wifi you can keep up to date with the outside world if you choose to! The luxurious upstairs bedroom suite includes a freestanding bath, perfect for a relaxing soak, whilst the comfy bed offers a great nights sleep. A separate shower room is next door to the bedroom and has a large traditional shower and toilet. At the back of the property there is an outbuilding should you want to bring bicycles, whilst at the top of the garden there is a raised decked area which faces south west and offers open views over Dunblane. the perfect spot for a BBQ! Beautifully presented, The Cottage exceeded our expectations for a short break. Firstly, communications with the owner, Jo, were great - fast, friendly and full of good info! She had prepared the wood-burner for us and came in to personally welcome us shortly after our arrival. Jo waxed lyrical about the views from Dumyat and they were terrific (weather was kind!). We loved our stay at the cottage! It was exactly what we were looking for. It was clean, cozy, decorated to a very high standard and very central but remote, we didn’t need to drive anywhere. The icing on the cake was the log burner that was crackling away On our arrival, the chilled cava in the fridge and delicious home made treats-thank you Jo. Last but not least the bath, Heaven want one! We stayed at The Cottage for 3 Nights and it was lovely! The location was ideal for our wee break and the people in Dunblane are very friendly. Jo met us on our arrival and made us feel very welcome and The Cottage was equipped with everything you needed and to a very high standard. Also, the treats that Jo left for us were divine. Lastly, I have to say the bath - it was fantastic! The Cottage was a great experience! Bed was great (in UK you never know), my wife loved the bathtub, the kitchen was fully stocked if you wanted to cook, all the amenities of home. I highly recommend having tea or a cookout from their view in behind The Cottage. Very close to several eating places, a convenience store and don't miss the Cathedral! We wish we would have actually booked longer at this particular stay. Jo (the owner) was great! Met us at the Cottage and showed us around and was very accessible by phone as she lives not too far away. We will definitely repeat when back in the area and use as our home base! Thank you for your lovely review Robert. It was lovely to meet you both & I am so happy you enjoyed you stay. If you find yourself over here again you would be very welcome! Beautiful cottage in a really lovely location! Thank you so much for your lovely review, I am so pleased you enjoyed The Cottage & Dunblane. Stunning romantic boutique cottage in a perfect location. Everything you need o short walk through the lane. Jo , the host , is very helpful and goes the extra mile. The little treats on the table are delicious and the secret garden view is amazing. We will be returning now we've found a gem. Thank you Carol & Ian, it was lovely to meet you and am so glad you enjoyed your stay, it makes all the hard work worthwhile. Hope to see you again soon!